Part 3 hands-on skills test. You must have completed the online class via www.onlineaha.org in order to enroll and Printed Certificate. This Web-based eLearning course program is for individuals seeking an alternative (nonclassroom) method for completing BLS for Healthcare Providers or Heartsaver Courses. 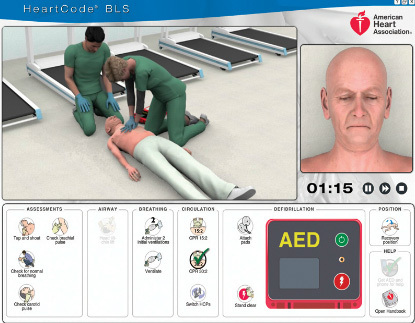 The eLearning component of BLS blended learning, this course uses a variety of eLearning assets such as dramatizations, eSimulations, animations, self-directed learning, and interactive activities to teach students BLS knowledge and skills. You must have completed the online course via the American Heart Association Online Portal www.onlineaha.org and have printed up the certificate with the serial number. The certificate with the serial number will look similar to the examples below, and you must bring it with you to your in person skills test. We will verify your serial number and ask you for identification. Please see eLearning Page for Complete Information on all Online AHA Courses. Certification: Two Year American Heart Association (AHA) Certification pending successful completion of Skills Testing. Once Logged on, pick "Course Catalog"
Have you ever taken a CPR course in the past?